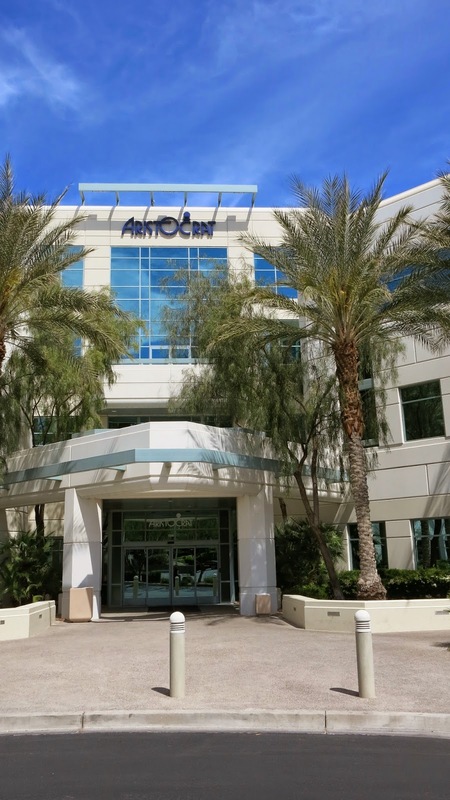 Thank you to the staff of Aristocrat for providing lunch for our group from the Slot Fanatics Forum at their studio on April 3rd and for the fun visit. Also thanks to Rob ( Nyphinix13: SLOT-a-holic's Channel on youtube) for arranging this with Aristocrat! After our tour of Bally technologies Ken drove Alicia (LadyClare), Cecil (Pawpaw) and me to Aristocrat where we met up with the rest of our SF group. Once we entered Aristocrat we were taken to a large room for lunch. Mrs Slotspert kindly takes a photo of Slotspert and me during lunch. Slotspert and Shamus of Slots! I forgot to take photos of the great luncheon spread they had out for us but they had assorted sandwiches from Panera Bakery, chips, pickles, beverages, including wine and beer. Deb and her husband Dave. Deb is one of the moderator/founders of the Slot Fanatic Forum. Skyler (Terra), Rambler (Al) and his wife Irisheyes (Margie) and their daughter Colleen. In the photo below I tried to get the whole group in a photo but missed a few. After lunch we signed our NDA's and a couple of the Aristocrat staff pointed out that our name tags indicated which group we were in for the focus study part of our visit. They had determined which group we would be part of by having all of us fill out a short online survey before our visit. Half of our group entered the showroom with the slot machines while the other half went in to conference rooms for the study. Later we swapped rooms. I can't recall the name of our focus study leader but she did a wonderful job and made sure that everyone was able to provide their opinions and feedback. I really enjoyed hearing everyone's views on slots and their personal style of playing them. While we frequently do the same on the SF message board it was great to be able to share our views not only with Aristocrat but during our other tours with WMS and Bally Technologies. Sorry I can't give out any specifics, as that was covered under the non-disclosure agreements we all signed. I was in one of the first focus study groups so after we let out I was eager to play some of the Aristocrat Slots. They had some slots that are currently under design for us to take a look at in the showroom and write down our opinions on but I can't give details of those or provide photos. 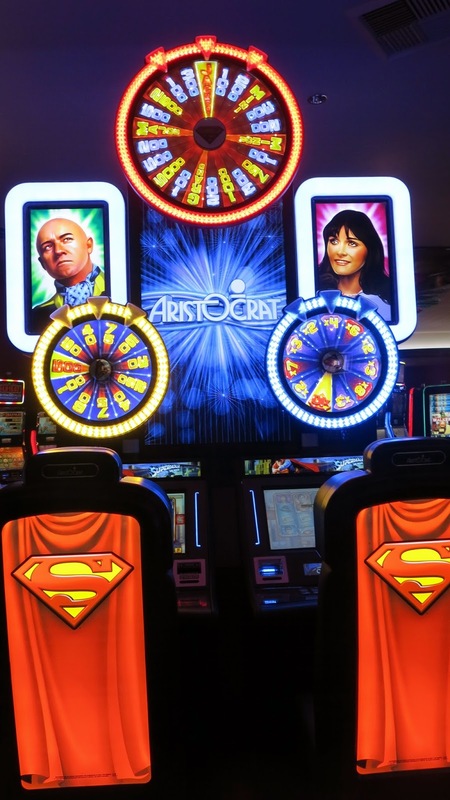 While Aristocrat didn't let us take any videos of their slots we were allowed to take photos of the ones that had already been announced at G2E last year like Batman and Robin, Superman and the Rolling Stones. 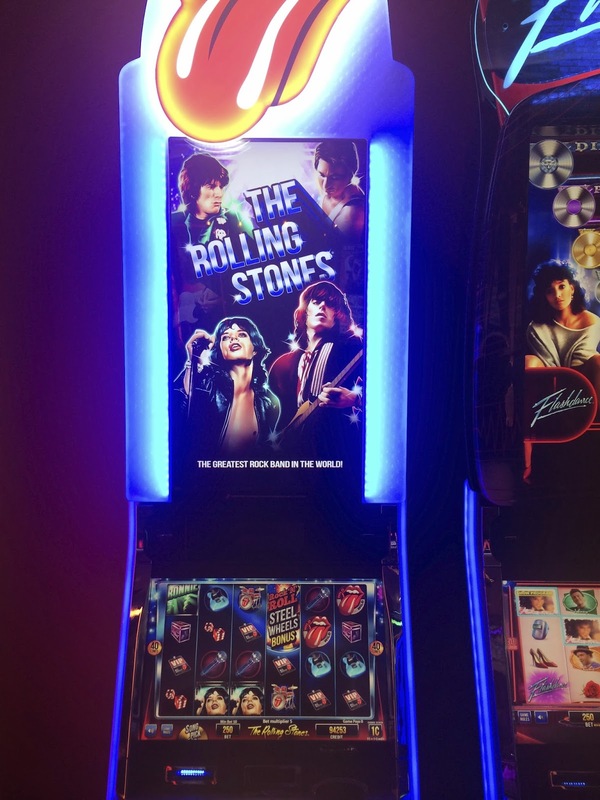 Got to love the Rolling Stones Slot, looking forward to seeing this in the casinos in the future! I enjoyed trying out the new slots and giving my opinions on potential new ones. I was hoping to discover a sequel to Miss Kitty, one of my favorite old slots, but alas didn't spot one. Before we left we were given a tote bag of souvenirs. Once I got home with my bag of goodies the Zorro stuffed doll was a big hit with our cats, their new favorite toy. 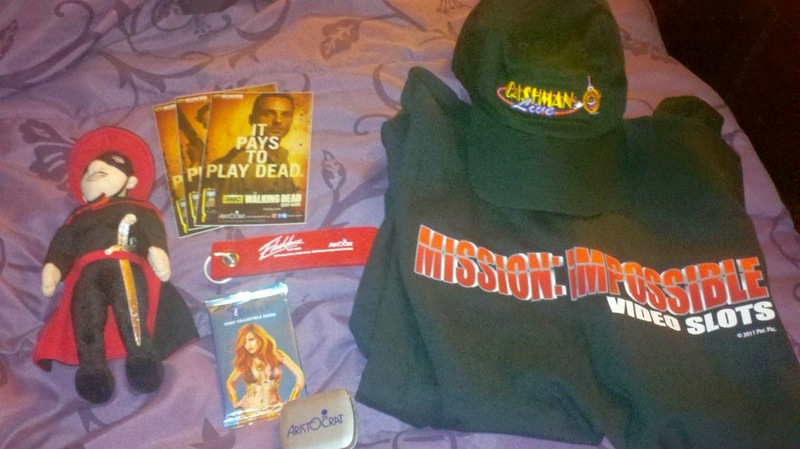 :) My son is currently wearing the Mission Impossible Shirt. On the back of the shirt it says: This T-Shirt will self-destruct in 5 seconds! Thanks for posting this tour report. It really looks like so much fun! Looking forward to seeing the Stones slot in the future. I like the idea of a Miss Kitty 2 - I hope you were able to suggest that to them. Hi Cheri, unfortunately I didn't ask about a Miss Kitty 2 or suggest it, but perhaps next time. 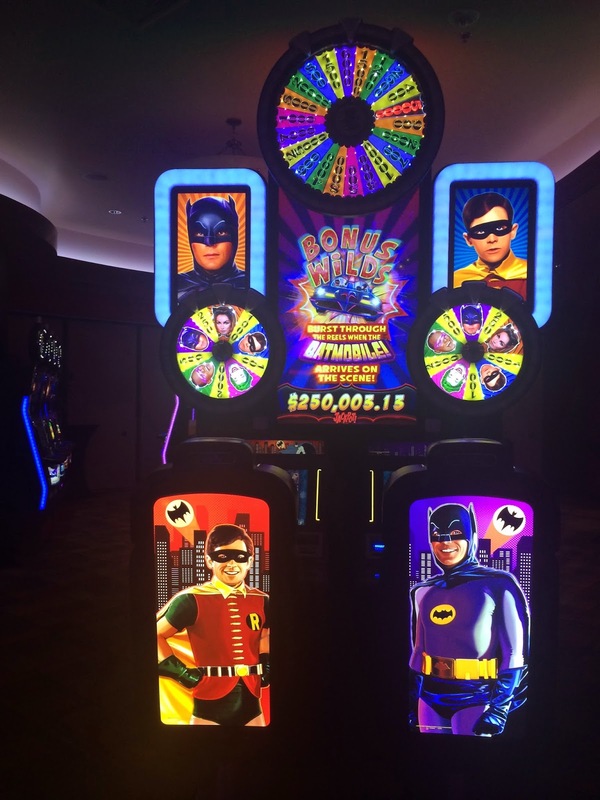 The Slot Fanatics Annual Spring Meet Trip!